I recently asked my son Simon, now in his fifties, if he remembered anything of our visit to New Zealand when he was two. He thought for a moment. “I remember the frogs.” Ah yes, the frogs. Actually they were cane toads, but a two-year-old doesn’t bother with such distinctions. Our flight from San Francisco to Auckland had a six-hour layover at Nandi, Fiji. When we arrived in Nandi at 4:00 am, we learned that the airline had very kindly provided a motel room so that we and the children could get a little rest. Tony and I looked forward to this. We were flying Qantas Airlines, and a bunch of young Australians partied all night in the rows behind us, oblivious to the flight attendant’s efforts to keep them quiet. The children, however, would have none of this going-to-bed nonsense. Their circadian rhythms completely out of whack, Simon and his brother were bright-eyed and ready for adventure. We heard the toads first, a continuous high-pitched purring that filled the warm tropical night like the sound of a smoothly running motor boat. Then we saw them. Near the motel swimming pool stood a pole with a bug-zapping lamp attached. 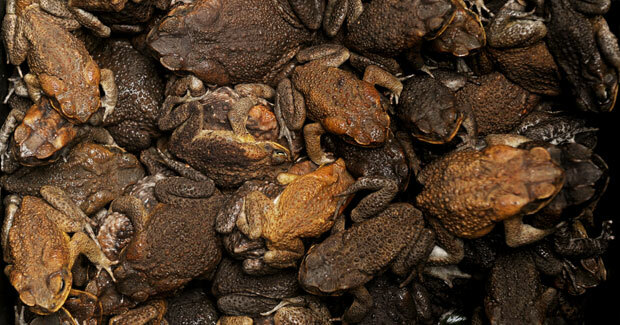 On the ground below, hundreds of cane toads clustered, waiting for the next flying creature to drop. The children were enthralled. Fortunately we did not allow them to go near the creatures, who can secrete a toxic poison. 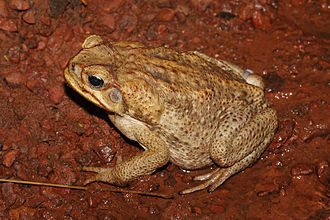 The cane toad (Rhinella marina) is native to South and Central America. In 1935 they were introduced to Fiji and other places to control beetles on sugarcane plantations. The trouble was, the toads couldn’t jump high enough to eat the beetles, which live on top of cane stalks. With no natural predator in their new home, the cane toads bred in large numbers, and have proved to be an environmental disaster. They have voracious appetites, and will feed on almost any terrestrial animal and compete with native amphibians for food and breeding habitats. Their toxic secretions are known to cause illness and death in wildlife and in domestic animals that come into contact with them. The cane toad disaster is a classic example of humans disturbing an ecological balance, inadvertently creating a new problem as they try to solve an existing one. Thinking about that tropical night makes me realize how little we still know about the complex interactions of the natural world. But on a personal, selfish note, the Fiji motel toads did provide entertainment for two rambunctious little boys. 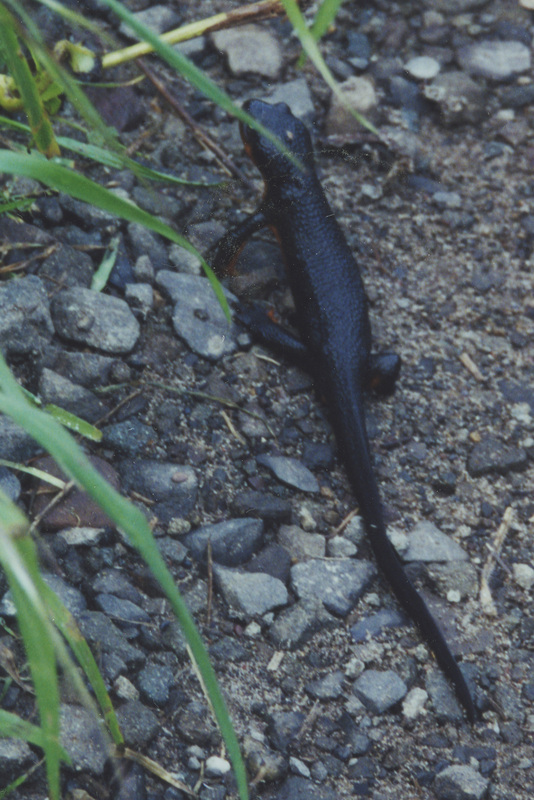 Now that our rains have finally started, the newts have come out of hiding. Last week I spent a couple of days at Green Gulch Farm, a Zen Buddhist retreat center and organic vegetable farm near San Francisco. 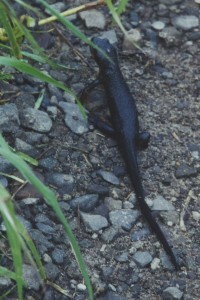 California Newts were all over the paths. Their brown skin smooth, their underbellies a brilliant golden yellow, they were marching to the streams where they breed. This morning we had to step around another California Newt on a path at the Mendocino Coast Botanical Gardens, a little one in its rough-skinned terrestrial phase. It was reluctant to move, since it was busy consuming a large earthworm; the last half-inch of the worm still hung from its mouth. These encounters reminded me of visiting Montgomery Woods some years ago, when their close relatives the Red-bellied Newts were everywhere. I became fascinated with the story of their breeding migrations and wrote this poem, which was published in my 2007 chapbook, Quickening. What stirs, with the rain, that urge to return? before crawling transformed up the bank. under gnarled redwood roots in the ancient grove. she emerges to make the journey to her breeding place. that pulls her back as it pulled her mother back. then wander off to find good forage for the summer. that the stream will still flow clear and fast over rocks. like fertile newt eggs on the undersides of stones? A Sunday afternoon walk with friends up Fern Canyon in Van Damme State Park. The creek is running fast and high, the trail is squelchy. Signs of early spring growth: stream violets, trilliums and redwood sorrel in flower, green tips to the elderberry and salmonberry. Downed wood from last week’s storm. Wendy and I, who have lagged behind, notice a young woman squatting by a log at the side of the trail. She rolls it over. “Found anything interesting?” Wendy asks. “Salamanders,” says a young man at my elbow. “Six different species so far.” He holds out a cupped hand. “Ensatina eschsoltzi.” His voice floods with love for the bulbous creature on his palm, shiny gray-brown above, with pale orange underparts. “Here’s a lovely big Slender,” calls a girl at another chunk of log. Everyone crowds around to admire her tightly curled prize. The Fern Canyon trail is blocked a mile or two up by downed trees not yet cleared. The trailhead restrooms are closed for lack of state funding. We could feel discouraged and depressed about California’s economic chaos. But the enthusiasm of these young people we met, their joy in their quest for knowledge, gives reason for hope.